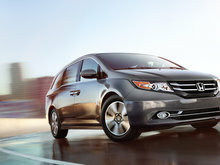 Originally created for the Japanese market after the economic crisis of the 1990s, the Honda Odyssey was eventually brought over to North American where it grew in size to suit the needs of Canadian car buyers. 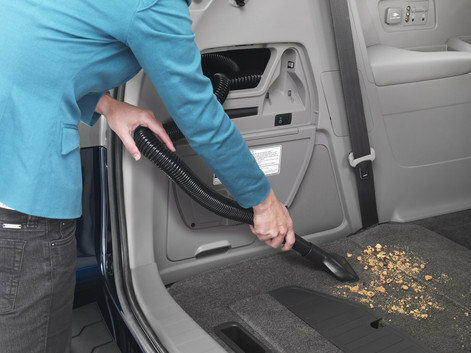 The Odyssey is a great choice for a minivan, especially when considering the versatile interior, sliding rear doors, engaging driving dynamics, V6 engine, and top safety ratings of the new 2015 model. 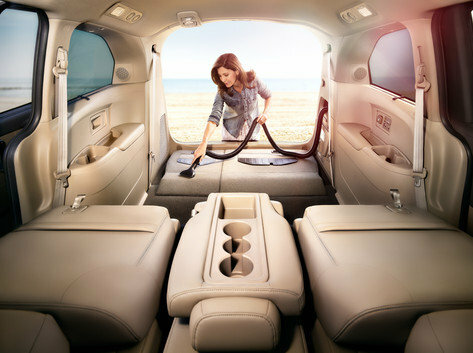 Families that choose to opt for a minivan are looking to make their life easier. A minivan can be a very practical choice, and when you have children, the more spacious and versatile the interior, the easier it will be for parents. Plus those power sliding doors certainly come in handy. 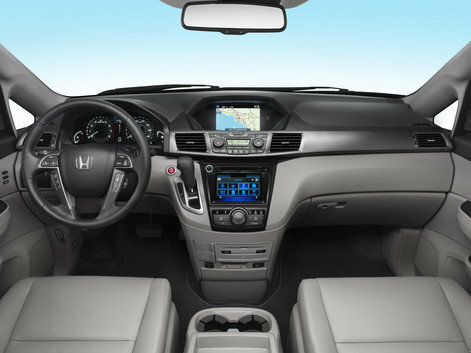 The 2015 Honda comfortably seats up to 8-passengers, and the second-row seats offer a wide mode adjustment that allows passengers to have more hip room, and can accommodate up to three full-sized child seats if need be. 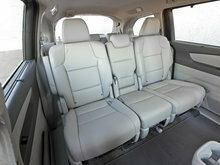 Owners can also slide the middle seat almost 6-inches close to the driver’s seat with the purpose of keeping some distance between the kids. 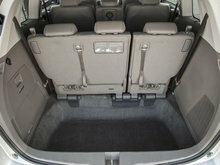 The 2015 Odyssey also includes a third-row Magic Seat, which essentially allows owners to split the seat 60/40, or buyers can pull on the seatback trap, and the seat will fold itself away quite nicely. 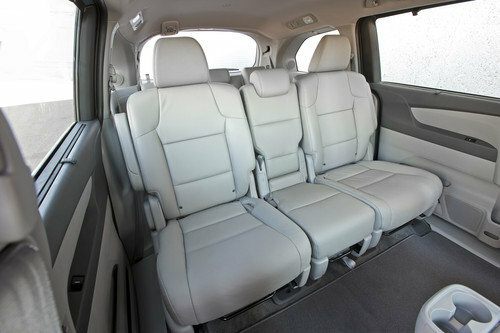 The second-row seats are also removable, so cargo space should not be an issue. 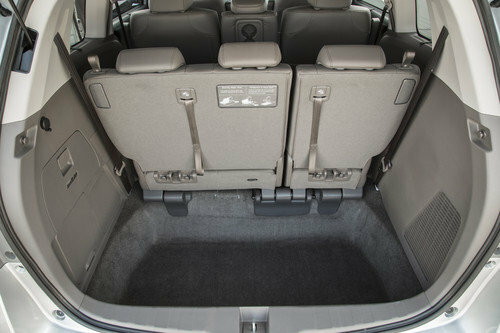 Finally, the new Odyssey offers lots of storage compartments, including an available cool box for drinks and snacks. 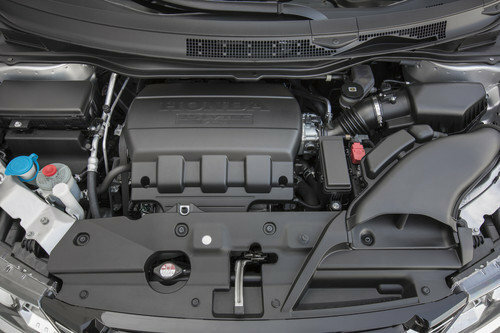 As for power, there is only one engine offered across the board: a 3.5-litre V6 engine producing 248 horsepower and 250 pound-feet of torque, and coupled to a 6-speed automatic transmission. 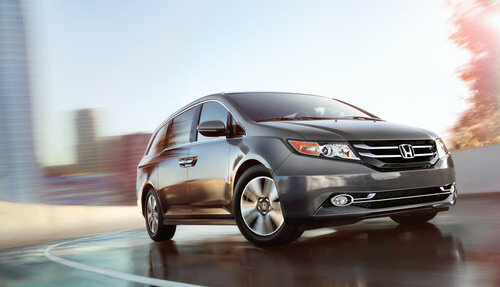 When driving the 2015 Odyssey, passing slower vehicles on the road will not be an issue. 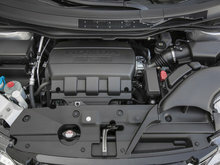 The vehicle’s precise and responsive steering is commendable, handling feels secure, and ride comfort is just right. Wind and road noise should not prove bothersome either due to standard active noise cancellation. 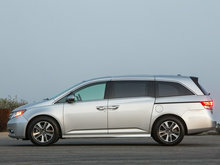 Fuel economy ratings for Honda’s minivan are 12.3/8.5 litres per 100 kilometres (city/highway), and the combined rating is 10.6 L/100km, which is quite fuel-efficient. Parents who are concerned about safety will be pleased to note the 2015 Honda Odyssey’s top 5-star overall rating from the National Highway Traffic Safety Administration. Elements like vehicle stability and traction control are standard, and active safety systems like forward collision warning and lane departure warning are available on the top EX-L Res model. Other features to consider, available depending on the model, include tri-zone automatic climate control, HomeLink, Honda’s navigation system with voice recognition, an in-car vacuum, and finally a rearview camera. 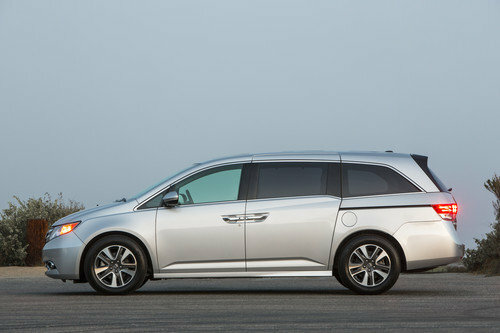 Elements like a push button start, heated front seats, power driver’s seat, satellite radio, and finally Honda’s rear DVD entertainment system are also among some of the interesting features offered by the Odyssey. 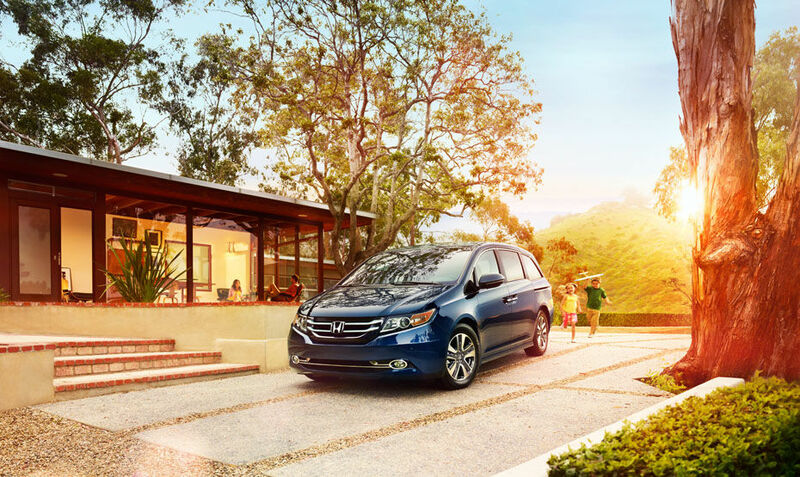 With the 2015 Honda Odyssey, priced from $30,250 MSRP, owners can enjoy a quiet, comfortable, spacious and versatile interior, good fuel economy ratings, the power of a V6 engine, and lots of features worth considering. Contact Bathurst Honda today for more information.